In today’s article I provide two short videos which show/describe my first training session in Israel. Beneath the videos I outline my specific goals, exercise selection, sets, reps, and rest periods. An Israeli man started to follow me around to tell me that Squats are bad for the knees and dips are hard enough without band resistance. I just smiled politely and gave him the ‘ol thumbs up. 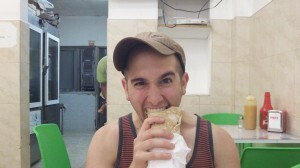 The best Shawarma in Haifa! More videos to come soon! If you don’t want to miss out on any new information make sure to subscribe to my YouTube Channel now.